And the plain my prey. In the context you've created here, Dante's 'Vide cor tuum' dream, in which a sleeping Beatrice is force-fed his heart, seems shockingly corporeal. Nora, could it be the shocking corporeality evoked in us by the allusion to Dante's dream has something to do with the movies and in particular the curious way in which popular horror sagas resuscitate the classics, even while the classics are crying out, "Hey guys, that's okay, I'm not drowning just waving, Don't rescue me -- even, I mean especially, not if cannibalism is going to be involved, and Hannibal Lecter is going to be lurking there in the audience, smugly smirking away at an anxious Inspector Pazzi, as if to say, 'Right, mate, and I'll be having YOURS for dessert, then.'" This aria, writ for film, was chosen to be performed at the Oscars in 2002 during the presentation of a lifetime achievement award to producer Dino De Laurentiis and at the 53rd Annual Emmy awards... while La Vita Nuova stands at a ranking of 2,137, 848 on the Jeff Bezos Index... proving once agan that when it comes to Box Office, movies are always going to be trumping Literature (if not eating its heart and spitting out the gritty bits, if any). It seemed to me he held a figure sleeping in his arms, naked except that it seemed to me to be covered lightly with a crimson cloth: gazing at it very intently I realised it was the lady of the greeting, she who had deigned to greet me before that day. And in one of his hands it seemed to me that he held something completely on fire, and he seemed to say to me these words: ‘Vide cor tuum: Look upon your heart. And when he had stood for a while, he seemed to wake her who slept: and by his art was so forceful that he made her eat the thing that burned in her hand, which she ate hesitantly. After waiting for a little while his joy was all turned to bitter grief: and, so grieving, he gathered that lady in his arms, and it seemed to me that he ascended with her towards heaven: from which I experienced such anguish that my light sleep could not endure it, and so was broken, and was dispersed. And immediately I began to reflect, and discovered that the hour in which this vision appeared to me was the fourth of that night: so as to be manifestly clear, it was the first hour of the nine last hours of night. Thinking to myself about what had appeared to me, I decided to make it known to many who were famous poets of the time: and as it was a fact that I had already gained for myself to some extent the art of speaking words in rhyme, I decided to shape a sonetto, in which I would greet all those faithful to Amor: and begging them to interpret my vision, I wrote for them what I had seen in my sleep. And then I began this sonetto, that which begins: A ciascun´alma presa e gentil core. greetings, in their lord’s name, who is Love. whose memory fills me with terror. my lady wrapped in a cloth sleeping. And then, I saw him leave, weeping. The situation in the poem is not literary but autobiographical -- always a problem with poems, and probably most often a mistake when the poem comes out begging to be explained. And of course, any response to the sense of a need for explanation is also an implicit admission of the imperfection. Then again, nobody's perfect, least of all around here. Anyway, it so happened that, fifty years ago, footloose and wandering the roads of Normandy, I encountered three Arab migrant workers who were on their way back to Africa after work stints in Northern Europe. An Algerian driving, two Moroccans as passengers. They couldn't sort out the road markers. It was proposed I accompany them the rest of the way. My appointed rôle would be to read the road signs and announce directions, as we went along. This proved a somewhat more difficult assignment than first supposed, as no stops or rest were built into the voyaging plan. So it was one long, increasingly drowsy "tout droit, gauche, tout droit", & c., all through two very long days and nights, as we passed, in this extremely dilapidated vehicle, all through France and into Spain and thence to the port of Malaga and thence by car ferry over the water to Melilla... where the trip proper actually began. First, the Algerian driver wanted to depart toward Oujda, and by that time he had conceived a substantial fee we were all meant to be paying for what he was now insisting had been a taxi ride all along. This phase involved a certain amount of compulsory yet nonetheless intimidating cultural ritual, angry spitting upon the ground and cursing in Arabic, etc. Next phase involved getting another willing driver (not easy), and then getting through the customs station, which was then located in an even smaller version of that little customs shed seen in the bottom photo here. The more commanding and communicative of the Moroccans, a handsome and gentlemanly fellow named Hassan, had, it seemed, slightly exceeded the designated terminus date on his work permit. This, it soon developed, was a major no-no. Hassan was in that customs shed for a long time, maybe a half hour. When he came out, he said nothing, but it was plain that he had been beaten up. We then were off again, over flooded passages of road, through bare scrub semi-desert, and on to the small mud-hut village where Hassan lived, and where he was, it was clear, regarded as something of a local hero. Everyone was incredibly poor, and the impoverishment in Hassan's home was visible and, to an outsider, a shock. The bare rooms in the family house held several extended families. Small children lay on the floors, flies congregating around them. There was little food. Yet Hassan insisted that a metal tin be taken down from atop a high cupboard, opened and offered. In the tin there were some biscuits that must have been in there for many years. It was staggeringly humbling, that moment -- a special occasion. The hospitality continued for some days, as I was shown the village, and treated as a special guest. Before going on my way... as the poem suggests. Of course, all of the above language addresses only the language part of the content of the post. The visual part is perhaps simpler. On an intuitive visceral level, fences like these tell us much. 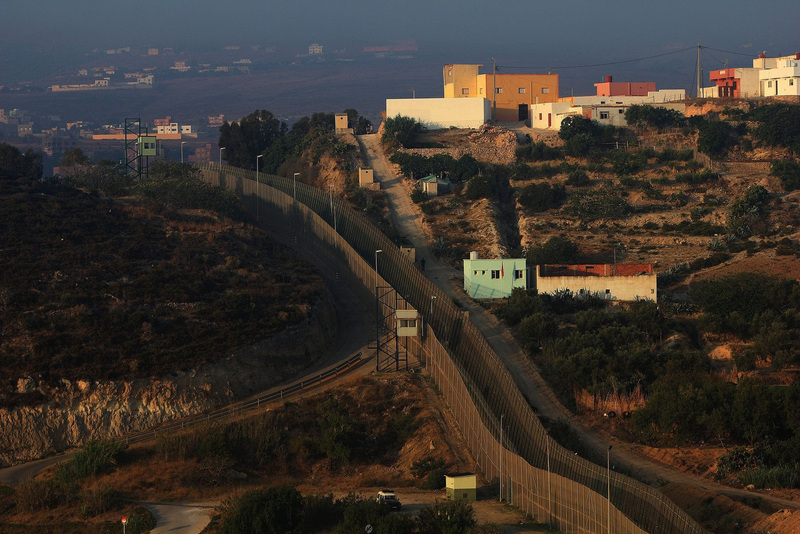 We have seen pictures of such fences on other borders where fearful societies have erected them to keep out the threatening hordes of the Other: thinking of, most recently, Arizona and the West Bank. 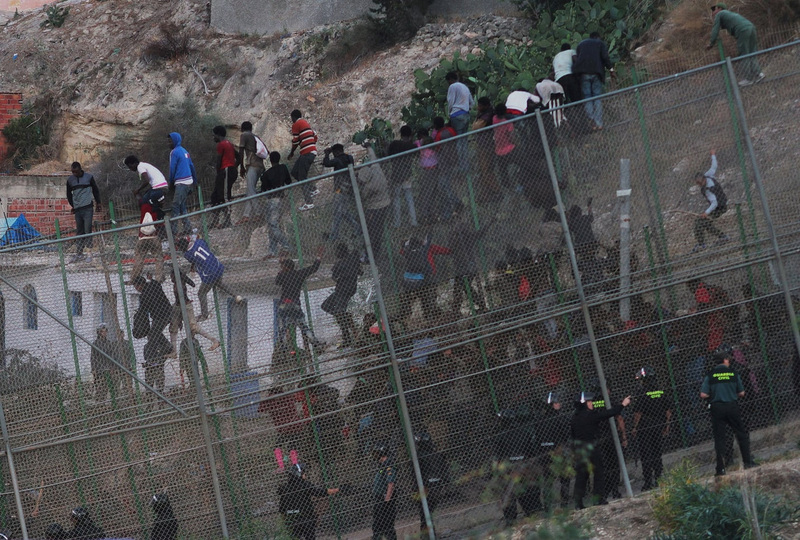 Though it's apparent from the photos that both the considerable chance of sustaining serious injury and the virtual certainty of failure and capture are included in the hard terms facing any of the fence climbers, Melilla remains the principal point of attempt for illegal entry into Europe via the Western Mediterranean route -- one of the region's major funnels for human traffic, employed currently by great streams of refugees from Syria, Libya, sub-Saharan Africa and other places where the living ain't so great. 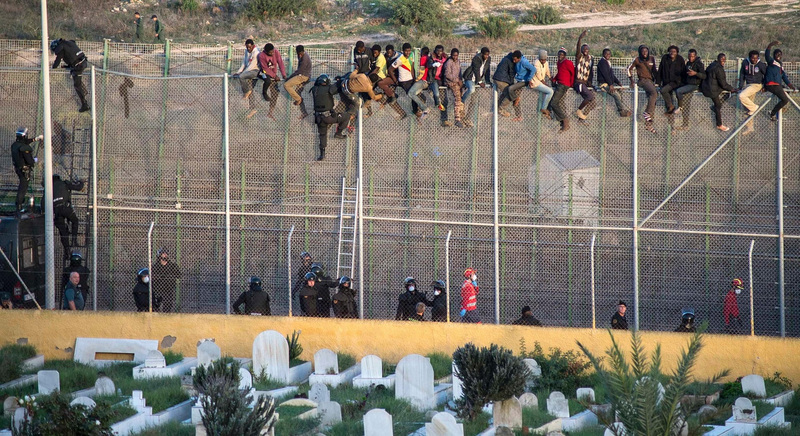 And this is not to consider the fact that for the large majority of the people on the fences at Melilla, this is only a late step in a long risky project; they have already had to endure an arduous and perilous boat trip or overland junket to get this far. The growing totals of refugees seeking asylum in Europe via the Mediterranean are no secret, nor are the causes of the massive flight of people from Africa and the Middle East. On 26 August the UNCHR put out some figures on the crisis, reporting that "The past few days have been the deadliest this year on the Mediterranean for people making irregular crossings to Europe". In 2011 around 1,500; in 2012 around 500; in 2013 over 600 and so far in 2014 over 1,880. In 2011 some 69,000; in 2012 some 22,500; in 2013 some 60,000; so far, in 2014 124,380. While some people are hanging from fences in search of a better life, others are asking "Golf, anyone?" The golf course shot tells it all. 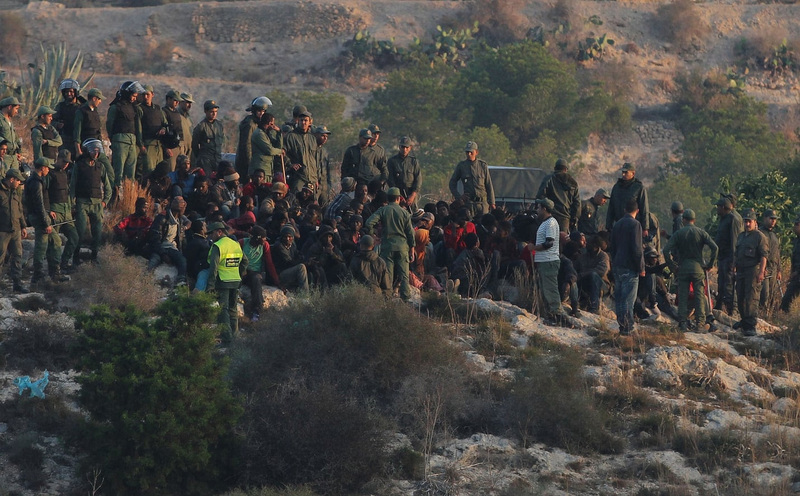 That story links over to another which has a 30 second Human Rights Watch video that shows the migrants stranded on the wall at night, along with their charming hosts from the Guardia Civil. You'd think somebody might tip the Spanish to where the less embarrassing features of their culture are derived. Not that the contributions of Arabs should be counted anywhere near so wonderful as the Baroque and the Inquisition, for example -- the "native elements" one might say. Thank you for this recollection, Tom. The people at our centre, from the agencies, coming in to clean when we're on our way out, minimum wage for proper slog, half of which they send home. Things don't change. The people who do the menial work here, too, are those who come from the other (lower, darker) side of great systems of barriers constructed to keep up for political purposes (forget economic, the domestic economy stands on their backs) the false impression there is some way to stop them arriving. Is not the night restless for them?